The Washtenaw County ID made its long-awaited debut on June 1, 2015, at the Office of the County Clerk. “I think our last count was close to 400 IDs distributed since June 1st,” Keta Cowan, CEO of Synod Community Services in Ypsilanti and Chair of the Washtenaw ID Task Force, shared on June 18. The ID (sample pictured), shares information similar to a driver’s license, but is used expressly to validate identification and prove residency within the county. The ID application process utilizes a 300-point system, in which varying forms of identification and proof of residency – each with their own point value – can be compiled to obtain eligibility. Eligible identification can include everything from a foreign drivers license or a school ID, to baptismal records or an affidavit from an identifying witness. Proof of residency can be obtained through such documents as a utility bill, or a letter from a social services agency confirming Washtenaw County residency. Thus far, Cowan says the biggest barrier she has seen for those applying for the ID is the lack of qualifying residency documents. She would like to remind applicants that residency documents must be dated within the last 30 days to qualify. The process of creating and preparing the ID for implementation has been a long one, but was an exhibition of “textbook collaboration,” says Cowan. “It was a public-private partnership.” The ID received buy-in from law enforcement, an integral step in getting the ID accepted across the county. The Washtenaw ID project would like to ensure the ID is accepted at institutions that meet basic human needs within the county, including health centers for low-income folks, emergency departments, credit unions, preschools and daycares, libraries, and locally-owned pharmacies. Measures to protect against fraud have also been utilized on the ID card, including a ghosted photograph, holographic images, a 2D bar code, and the use of UV ink. The need for the ID, says Cowan, stems from a lack of access to basic needs and opportunities for many in the community. An ID is necessary to identify oneself to law enforcement, open a bank account, rent a home, and even to borrow a book from the library. To Cowan, these basic human rights have become accessible only to those privileged enough to have an ID. Historically, groups who lack meaningful access to state IDs and drivers licenses include undocumented immigrants, some African-Americans, the elderly, individuals and families with low incomes, and the homeless population. Those who applied for the ID on the first day were largely Spanish-speaking or holders of Michigan Department of Corrections IDs, a distinction which makes it difficult for these individuals to find employment. The ID is $25. Scholarship funds are available for those in need. 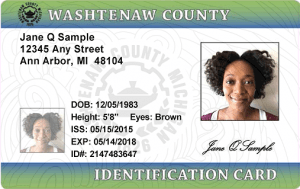 The Washtenaw ID is available at the Office of the County Clerk on Mondays and Wednesdays from 8:30am to 4pm, and on Fridays from 8:30am-12pm. Wait time averages half an hour.